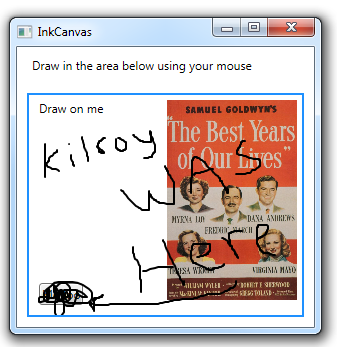 You can use the InkCanvas control as a blank canvas that you can draw on, using the mouse or a stylus. You can also include child controls in the InkCanvas in the same way that you add child controls to a Canvas. But with the InkCanvas, the user cannot interact with the controls, but can just scribble over the top of them. i have this situation where InkCanvas more than one (multilayer) and controlled with single control example a button enable and disable editing mode for those all InkCanvas, any idea? It’s not clear what you’re asking, but I’d recommend you post example code to stackoverflow.com and ask a question there.